This Seafood Paella with Cod couldn’t be simpler. A good sofrito, shredded cod, a few clams, and rice are enough. Of course, you can add all kinds of seafood (prawns, mussels, lobster, crayfish, etc.) or other vegetables, but I think it would take away the delicate taste of cod. The cod season runs from January to April in Spain, which is when it’s at its best. If you are going to buy it fresh, choose a piece with a bright light skin and light eyes. Cook it on the day, or the next day, but don’t leave it too much in the fridge. Salted cod is available at any time of the year, and is a good alternative to fresh. 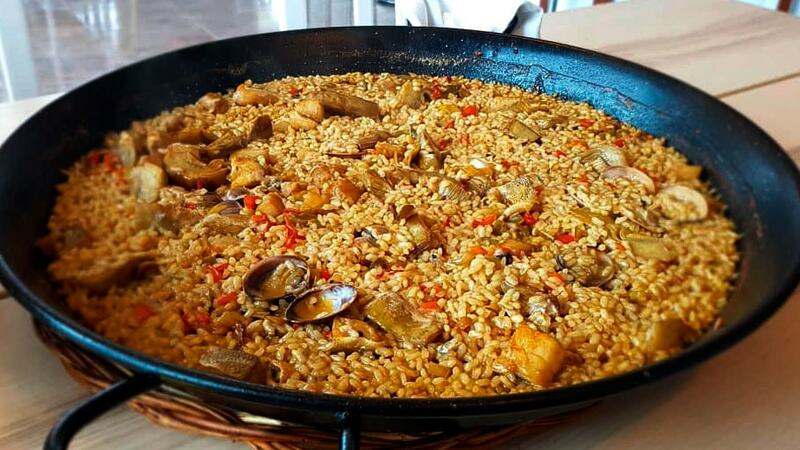 You have to be careful to let it desalinate two days before making this paella recipe otherwise it will be too salty. Are you a meat lover? Check out our paella chicken chorizo recipe in our home page! If you are going to use salted cod, you have to soak it for 48 hours before making this paella recipe, changing the water several times during the day. Afterwards, drain the cod and cook it over medium heat in a casserole with plenty of water. As soon as it starts to boil, remove it and let it cool down to remove the skin and fish bones. Strain and reserve the cooking stock. If the cod is fresh, do not soak it, boil it and reserve the broth as well. To clean the clams, soak them with cold water and a handful of salt, thus eliminating all the sand or soil inside. Once they release the dirt, drain and rinse well, and reserve them. In a frying pan heat a dash of olive oil and fry the chopped green capsicum without seeds. When it is tender, add the chopped garlic cloves and let them brown. Meanwhile, blanch the tomatoes in boiling water for a couple of minutes and then cool them on ice to stop cooking. This way we won’t take long to peel them, remove the seeds and chop them finely. Add the tomatoes to the frying pan and cook over medium heat until almost all the liquid in the tomatoes is reduced. When we have a good sofrito, add the crumbled cod to sauté all together for a couple of minutes. Pour the broth leftover from the cod, and if it does not reach a liter, complete it with water or hot fish broth. The ratio of water and rice has to be 2:1, being twice the amount of water than rice. We wait for a boil and add the paella rice, clams, salt to taste and chopped parsley. Stir well so that it is distributed and let it cook over high heat for the first 5 minutes, lowering the temperature to the minimum so that it continues to cook for 10 more minutes. Remove the rice from the heat and cover it so that it rests 5 more minutes before serving. The clams will have to be open, if some of them don´t, get rid of them.